I received a big box of goodies from the NBC Store, and it’s time to start giving stuff away! 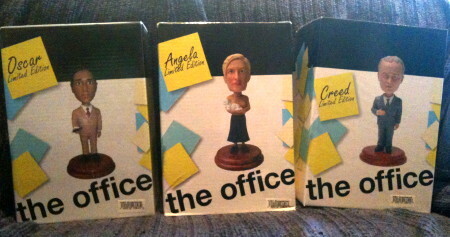 Giveaway #2: Angela bobblehead, Aug. 7-10. Winner: Scott B. yay!! is there any limit on how many times we RT each day? i agree! i hope i did it right I’m sort of new to twitter. I’m really excited about this contest! What if my tweets are protected? You won’t be able to see it!! what day are the first couple going on sale??? I’m still very new to Twitter…I just attempted to Retweet, I hope it worked! Bobblehead Giveaway #2 starts after this comment. I think it’ll be Heavy Competition. I didn’t really like that episode. The next episode to be voted off with definitely be “Broke”. It just doesn’t stand out as much as the others. The Michael Scott Paper Company, I’m surprised it’s made it this far! Stress Release- Didn’t need to be an hour long. The beginning and the end were the best parts. It really needs to be Heavy Competition. All the other episodes stand out so much more than Heavy Competition. I would have to say “Heavy Competition”. I have no idea if this episode will be voted off or not, but I have to say WEIGHT LOSS. Having Holly in the episode was great but… yeah, that’s about it, especially when compared to past season premires. I think it will be The Michael Scott Paper Company. The Michael Scott Paper Company will be voted off. Who cares what a rundown is? Although I really liked that episode! I have a feeling that Heavy Competition will be next. Customer Survey got to go. Looking at each of those episodes left, I must say The Michael Scott Paper Company is the least awesome (though still pretty darn awesome). I think Heavy Competition will be the next episode voted off. I’m going to say “Heavy Competition.” Why? Because I saw this guy at a Friday’s in Miami the other day who looked just like Idris Elba. Heavy Competition. I love it but it is the weakest of the remaining episodes. The Michael Scott Paper Company. I think Heavy Competition will be the next voted off! Heavy Competition is my guess. I swear, it’s just a coincidence it’s the one I want off, too. Why are you looking at me like that? Even though there is no limit to the number of cheese balls you can throw at someone, heavy competition can’t stick around forever. Heavy Competition is a great episode, however I think it will get cut. I’d say “Heavy Competition” will be voted off next. Please let it be The Michael Scott Paper Company. ‘Heavy Competition’ has heavy competition, so it will go. Heavy Competition will be voted off next! I think Heavy Competition is next to go. All of the other remaining episodes are too good! I think The Michael Scott Paper Company will go next. I’m going with Heavy Competition. I think Heavy Competition will be voted off next. I’ll go with Customer Survey. I think “Heavy Competition” will be the next to go. It’ll be close, though. I cannot BELIEVE that is still there! It would have been in my bottom half! You who voted off Cafe Disco and Company Picnic first should be ashamed! Customer Survey will be voted off next! Heavy Competition will go (I think). I think Heavy Competition will be voted off. Really surprised that one is still up. I never really liked that one. I think that’s the only episode of the Office that I have disliked. I remember being super stoked to watch it. I went to an “Office Party/Oh yeah, we’ll watch the super bowl before that too” shindig, and everyone was pretty disappointed with Jack Black and Alba being in it, and that whole plot line. I’m gonna say “The Michael Scott Paper Company” will be the next one voted off. I think the next one to go will be Heavy Competition. I would have to say it will be Heavy Competition. I believe that Heavy Competition will be the next to go. Heavy Competition is my vote! I think “Heavy Competition” will be voted off the next poll because I was really excited to watch this episode when I saw the promos, but I felt disappointed afterwards. I didn’t like the storyline with Andy and Jim. I also thought the Dwight, Michael, Charles storyline would be a lot funnier than it was. I like this episode the least out of all the options, so I think it should be next to go. My prediction is The Michael Scott Paper Company. Customer Survey will be voted off. Heavy Competition will be gone next, I think. My guess will have to be “Heavy Competition”. I believe the next one to go will be Weight Loss. And for brownie points i wrote a song. The Michael Scott Paper Company should be the next to go. I think The Michael Scott Paper Company should be the next to go. Giveaways #1 and #2 are now closed. Giveaway #3 coming soon! Thanks so much for these contests. They’re great! You should pick a few of your favorite taglines entered in the contest on T-Shirts at the OT Stores (Front: Officetally | Back: Tagline) — I’d love to see some new merchandise there! Keep up the good work, Tanster!